Bayani Fernando wins "Celebrity Duets 2"
When Bayani Fernando won Celebrity Duets 2 last night, November 8, he donated half of his winnings to two institutions: Caritas Manila and C.H.I.L.D. House. After months of being the all-time crowd favorite, it didn't come as a surprise that Metro Manila Development Authority (MMDA) chairman Bayani Fernando was named as the grand winner of GMA-7's reality singing competition, Celebrity Duets 2. Last night, November 8, he bested two finalists TV host-comedian Joey Marquez and fashion designer JC Buendia and bagged the coveted title along with P1 million pesos. Looking back, it has been a great musical experience for the eight celebrity contenders including the eliminated contestants model-actress Melanie Marquez, health and fitness guru Cory Quirino, chef JC Cang, soccer hunk Phil Younghusband, and beauty queen Carlene Aguilar. They were all able to who overcome their inhibitions and show their confidence during the musical extravaganza. The show's finale was composed of two rounds: the first involving each of the contestants' favorite duet partner chosen from any of the past episodes and the second, with an entirely different music icon to add zest to the finals night. The grand finale was graced by the show's three celebrity judges: musical director and composer Danny Tan, stage director Freddie Santos and Season 1 Grand Winner Tessa Prieto-Valdes. The show's hosts Ogie Alacasid and Regine Velasquez were also present, as well. For the initial round, MMDA head Bayani Fernando wowed the crowd along with his favorite duet partner Pilita Corales. The pair rendered a song reminiscent of the Filipino Bayanihan titled "Ay Ay Ay O Pag-Ibig", with the law enforcer sporting a native-inspired number comprised of a pair of baby pink trousers, a light brown polo, and an off-white bandana tied around his neck. Pilita, on the other hand, wore a red Filipiniana costume to match that of Bayani's. Next was Joey Marquez with best bud Keempee de Leon both wearing shiny black coats, singing the heartmelting and romantic staple "What Matters Most" popularized by Kenny Rankin. They were followed by JC Buendia and partner Allan K who once again whipped up a grand production number, this time boasting of flower-wearing dancers and cute yellow shirts with little rag dolls sewn in front. The energetic duo moved and grooved to "Build Me Up Buttercup" by The Foundations. No comments from the judges were heard on the first round, only messages. For Danny Tan, he told Bayani, JC and Joey, "I'm so happy to see the three of you here. You've improved so much. Relaxed na kayo ngayon." "I love it! Congratulations! You guys have improved since the first time," Tessa agreed. Freddie was touched by the lessons learned by the contenders from their stint in Duets. He said, "Ma-apply niyo man ‘yan sa mga sari-saring bahagi ng inyong buhay...ang mananalo ay kayong tatlo." The second round went on smoothly with Ogie announcing that charitable institutions will benefit from half of the winner's cash prize. First was Joey Marquez who sang Mike Francis' "Friends" with concert queen Pops Fernandez. The host-comedian chose Sta. Rita Orphanage as his beneficiary. Next was JC Buendia who was partnered with SOP mainstay Jonalyn Viray and sang "The Way You Look Tonight". He chose five beneficiaries: Breeze of the Sacred Heart, Tahanan ni Maria, Marilac Hills, Philippine National Red Cross and Bahay Kalinga. Lastly, Bayani Fernando performed "Corner of the Sky" from the musical Pippin with balladeer Basil Valdez. He opted to give half of his winnings to two institutions: Caritas Manila and C.H.I.L.D. House. Before the much-anticipated announcement, the three finale contenders sang Neil Sedaka's "Laughter in the Rain' with hosts Regine Velasquez and Ogie Alcasid. Finally, Ogie and Regine read out the MMDA chairman's name out loud, which was received tearfully by a very happy Bayani Fernando. 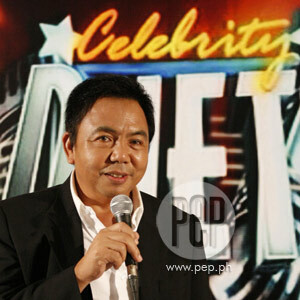 Celebrity Duets 2 aired Saturday nights on GMA-7.